What is AYG Crystal Salt Lamp? It's made of 100% natural Himalayan salt crystals,Each lamp is manually mined in the Himalayas,shapes and shapes are unique,naturally emits negative ions to counteract electromagnetic radiation,also helps you sleep better at night, allowing you to wake refreshed, breathe smoother, and soothe allergies. Special Function To Use These AYG Salt Crystal Lamp! Natural air purifier to help you breathe easier! Speed up the metabolism so that the whole body system has been clean! It introduces us to new experiences, helps us relax! Eliminate fatigue, make your body feel more comfortable! Adjust allergies, asthma and other common childhood diseases and adjust the immune system! Take care of your salt lamp,Only use dry,clean,soft cloth to clean the surface of the lamp,Do not wash with water or other liquid cleaner! Please keep the lamp dry,if it gets wet,let it dry,Humidified vapor or liquid usually contain minerals that erode the salt lamp! Be especially careful,prevent falling out,don't knock or shake，it might crack the lamp or bulb! Please make sure that the switch on the lamp is turned off,Then plug it into the wall plug and turn it on! What are you waiting for?Scroll Up & Click Add To Cart Now! Due to the natural variation in Himalayan Crystal salt,Each&every Salt Crystal Lamp is a piece of a natural rock formation and is unique in color,shape,pattern and weight, you will receive one similar to the images shown. AYG Himalayan Salt Rock Lamp enhances the ionic balance of your living spaces.When heated,the salt crystal lamp emits negative ions that fight against electromagnetic radiation,improve health ability,increase the flow of oxygen to the brain,helps you sleep better at night, allowing you to wake refreshed. 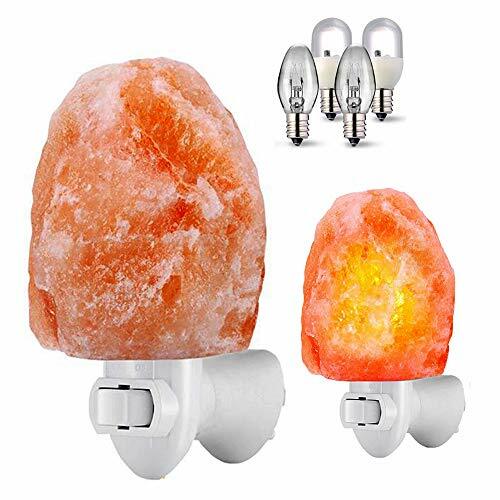 Each&every AYG Salt Crystal Lamp comes with a UL certificated Plug,which can be adjusted for 360 degree,Plugs right into the wall with no cords to trip over or extra space needed,3 prongs for stability. AYG Crystal Salt Lamp pack with 4pcs bulbs:two 7W incandescent bulbs and two LED Changing Bulbs;incandescent bulbs bright enough as a gentle nightlight for bedroom it will emit a warm and calming amber glow to your bedroom；LED Changing Bulbs automatically change 6 colors，Providing you a romantic lighting atmosphere with beautiful radiant light, relaxing you from stress. AYG Crystal Salt Lamp is shrink wrapped with polyethylene & boxed to trap moisture and grant protection from unwanted shifts to preserve the unique designer craftsmanship.When lit,it looks gorgeous like a lava lamp,it's a perfect gift for Christmas, holidays,birthdays,graduations,thank-yous,and special occasions. If you have any questions about this product by AYG, contact us by completing and submitting the form below. If you are looking for a specif part number, please include it with your message.